DC Brau is exactly what TheHaySay is about. A high quality, local beer, perfect for post run re-hydration. I guess I might be a little late to jump into this DC Brau review game, but better late than never. If you haven’t heard, DC Brau Brewing Company is the first production brewery in over 50 year to locate its tanks inside the District of Columbia. A few weeks ago they blasted off into local stardom with a huge launch party over at Meridian Pint. Unfortunately I had to miss the big event due to some other plans, so I made sure to grab a sixer of the Public Ale as soon as they were released. The Public Ale is an American style Pale Ale, secretly trying to be an IPA. They can call it a simple Pale Ale all they want, but from first sniff you are loaded with the delicious American hops that overwhelm the aroma, and you immediately think IPA. After a first sip, a few other flavors flow down the tongue, such as a definitive citrus note that comes through pretty strongly. The brewery will only be releasing its beers in cans and kegs, which I think is both a unique and exciting, making them the perfect beer for floating down a WV river or throwing a few in the cooler out at the campground. 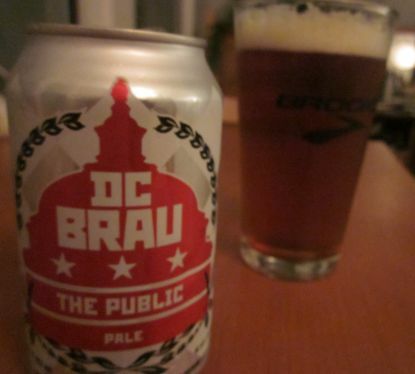 After my first few tries of The Public, I’m really looking forward to future releases by DC Brau, especially The Corruption IPA, which I can only imagine will have hops popping out of the tin lid. The only major flaw I found was the price. At $12.00 for that first six pack, I’m not sure I’ll be buying these for much more than a treat. Hopefully that is just the hyped up price, which should hopefully settle into a more reasonable $8-9 soon. The DC Brau website has a great interactive list of where you can grab a pint or a can, so there is no reason not to check it out. Have you tried it? What did you think of The Public ale? Worth the money? Cheers! How have a I missed this? The beer looks and sounds really great, but who in the hell charges $12 bucks a sixer for their staple, non-specialty beer? The price craziness of DC–whether it’s a pint at a bar or the Dupont farmers market tomatoes–is something I could just never get used to. No kidding! The price is outrageous. I’m really hoping that it was a first week thing, and the prices will settle down. The cans were on such high demand, I’m sure the stores could charge whatever they wanted. You are right though, it is amazing how much you’ll pay at just about any bar or farmers market.